A unique garden structure you can add in your yard. Some homeowners want to spend their time in the garden or in the outdoor areas because they want to breath fresh air or they just want to enjoy the beauty of nature while doing different activities. It would indeed be nice to read a book while outdoors or just chat with friends while eating snacks or drinking coffee. Still others prefer to work outdoors like painting, writing and others. That is why some homeowners add a shed in their backyard or a just a tiny area for them to do some work. 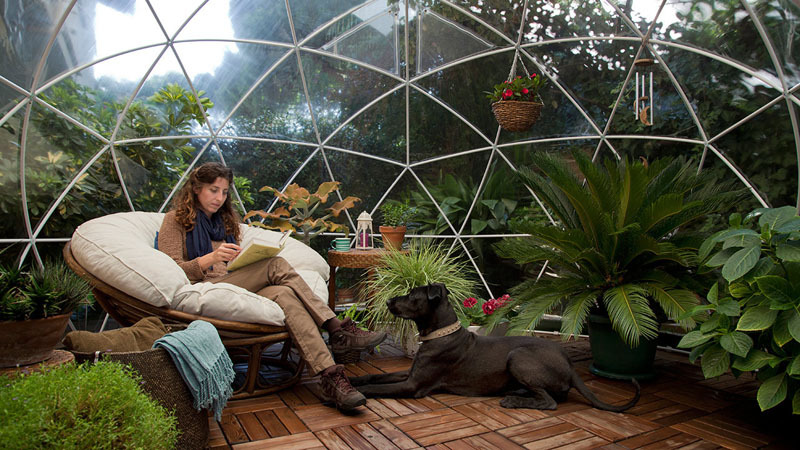 Today, we are going to show you a garden igloo which is designed by Cagla Isin Alemdar. 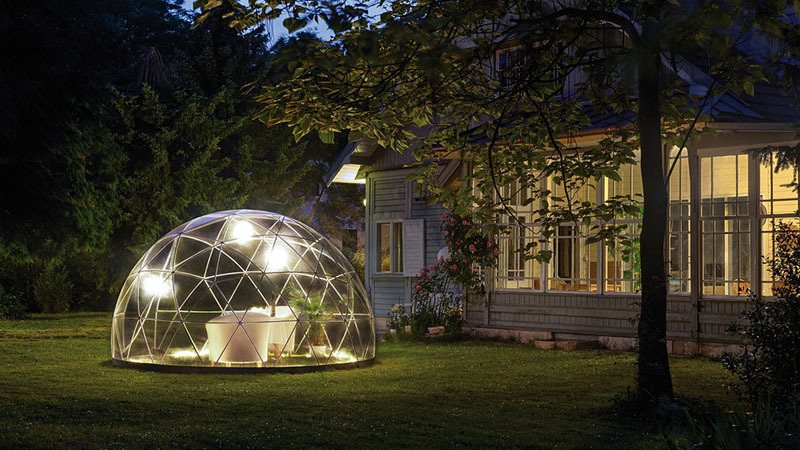 The idea of a garden igloo sure is unique. Because of that, Alemdar spent two years designing the Garden Igloo as a way to enjoy the space in your backyard in whatever kind of weather. The design is not just unique but it is very appealing too. When placed in the garden, it actually looks like a sculptural item that will even make you want to have one. And once you see it, you will surely want to get inside and try how it feels to be inside the igloo. Yes, it is indeed very interesting. Let us take a look at the images of the garden igloo below. Unique feature: A designer created a garden igloo which you can add to your backyard or any area in your garden so you can spend time in it whatever the kind of weather is. Sitting on the pavers is a beautiful garden igloo which is the highlight of the garden. And there are plants inside it too. Of course, you can also add more chairs if you want to as long as they aren’t too big. While inside the igloo, one can have a great time doing whatever they want. Kids can play around while adults can read books and other interesting things. Even merely chatting with friends will be a good way to spend time here. 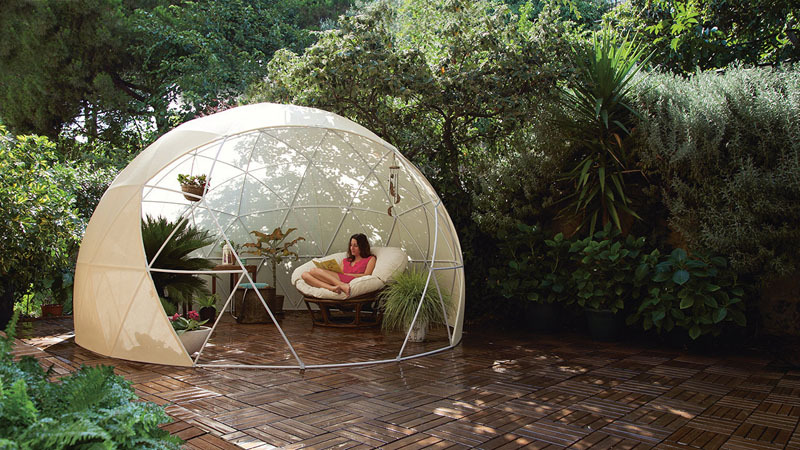 This multi-purpose geodesic dome is large enough to stand up in. 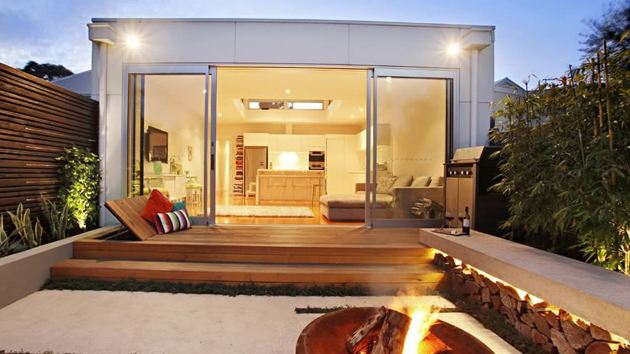 It is also able to be completely enclosed, protecting those inside it from rain, wind, or insects. It’s designed to be able to easily change covers depending on what it’s being used for. There’s a transparent cover, a canopy cover, and a mosquito net cover. I even think that it would be nice to sleep over here, just like what we do in camping. 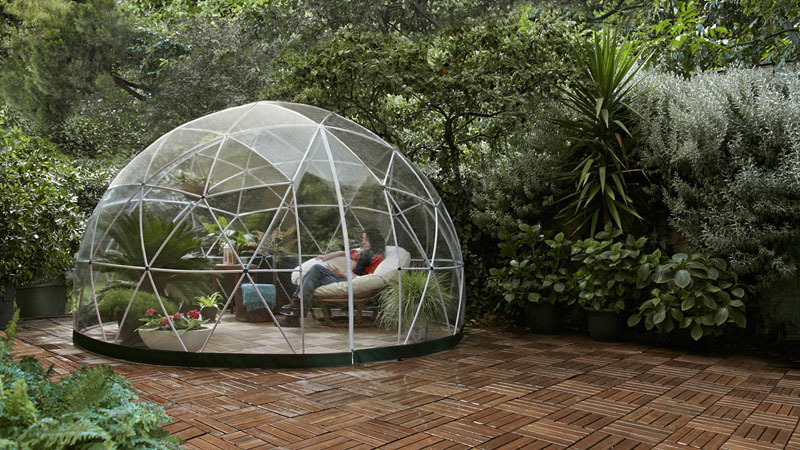 The Garden Igloo is an easy way to add an enclosed room to your backyard. You could even add furniture inside it without worrying about everything getting rained on. During the night, the igloo looks really nice with the lights in it. It will also be a good venue for a romantic dinner. I would guess that you now want to have one of this after seeing the images above. 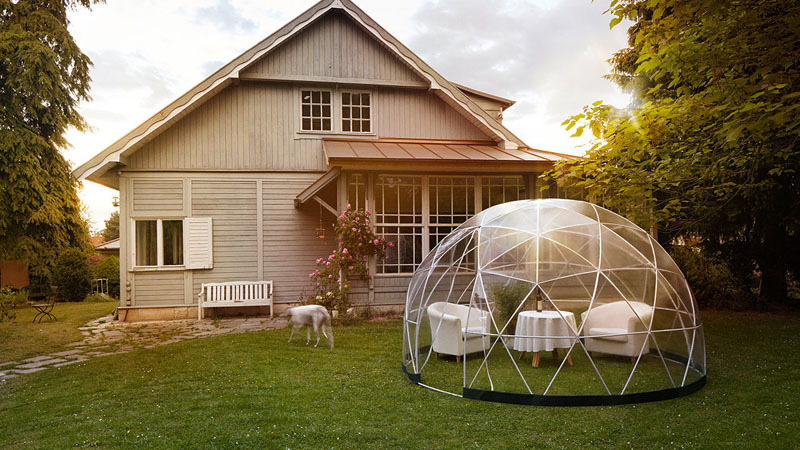 Of course, it would be nice to have this Garden Igloo that isn’t just a nice place to stay but it will also make you feel like you are one with nature despite the igloo around you because of its transparent material. And it is also durable too. You can even stay there even when it is raining. It can be stylish conservatory, a play area for children, or even a greenhouse or gazebo. Yes, the igloo can be everything that you need and you want! I won’t blame you if you now feel the urge of getting one for your home.